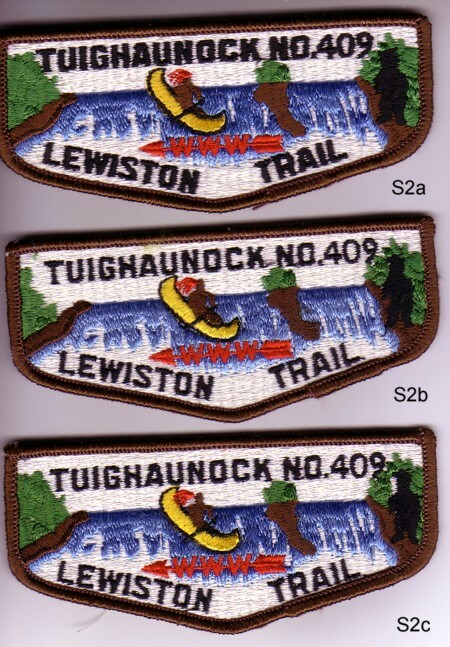 I have recently picked up a couple of issue variations that I needed from Tuighaunock Lodge #409. Over the next several posts, I will provide images of all of the varieties from each issue, so they can be seen and compared side by side (or above and below). Some of the color differences are very minor and require both flaps for comparison. The first ones are the S2a, S2b and S2c. For the aquatically challenged, one Gunwale means you can only see one side of the canoe. The color change in the blue in the 2a and 2b is very minor. As you can in the 2c, the red headdress is blowing off the canoeists head.